Orthex Group, a leading manufacturer of household products in the Nordic, operates in a sector where the customers have high demands on short lead times and on-time delivery. When unexpected large orders are common and the company growth increases supply chain complexity, it puts pressure on the production planning process and the planners involved. For Orthex, unexpected large orders are very common and usually have a short delivery time between 48 hours and a week. Such short lead times require a production flexibility and an ability for quick adaption. To ensure customer satisfaction and product availability, a streamlined production is of most importance. As Orthex has grown, also the production and factory planning has become more complex and time-consuming. 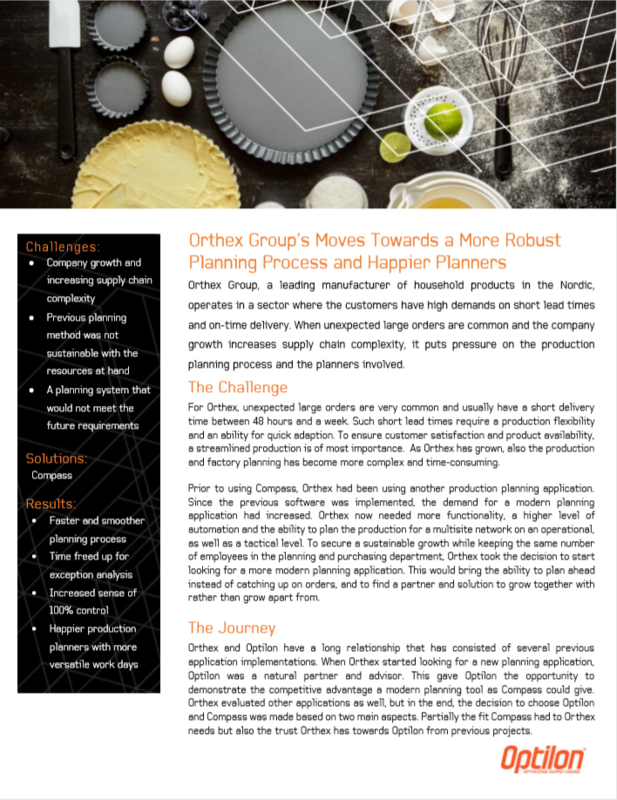 Prior to using Compass, Orthex had been using another production planning application. Since the previous software was implemented, the demand for a modern planning application had increased. Orthex now needed more functionality, a higher level of automation and the ability to plan the production for a multisite network on an operational, as well as a tactical level. To secure a sustainable growth while keeping the same number of employees in the planning and purchasing department, Orthex took the decision to start looking for a more modern planning application. This would bring the ability to plan ahead instead of catching up on orders, and to find a partner and solution to grow together with rather than grow apart from. To read the full customer case, download the PDF below.